Transition-metal-catalyzed enantioselective reaction is a promising strategy to obtain enantiomerically enriched compounds to support the ever-growing needs of pharmaceutical industry. Although carboranes are finding many important applications in medicinal and materials chemistry, the study of chiral-at-cage carboranes is still a blank field due to the lack of asymmetric synthetic methods. Icosahedral carboranes can be viewed as three-dimensional analogues to benzenes, whose chirality is determined by the substitution patterns on the polyhedron (Figure 1). Introduction of new chirality at the boron clusters can result in novel chiral-at-cage carborane ligands as well as important potential chiral drug building blocks. The XIE group from the Shanghai-Hong Kong Joint laboratory in Chemical Synthesis, Shanghai Institute of Organic Chemistry (SIOC) of the Chinese Academy of Sciences takes the challenges to develop new methodologies for transition-metal catalyzed selective B–H activation/functionalization of carboranes. On the basis of their previously reported palladium-catalyzed regioselective intramolecular arylation of o-carboranes , they developed an asymmetric B−H substitution strategy to generate chiral-at-cage o-carboranes with high efficiency and regioselectivity as well as enantioselectivity (J. Am. Chem. Soc. 2018, 140, 4508) (Scheme 2). 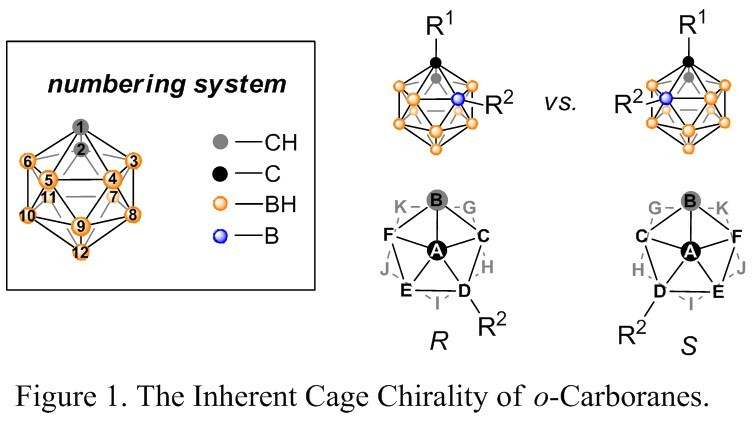 This is the first step toward new types of molecular design in boron cage inherent chirality, which will open avenues to a new class of chiral-at-cage o-carboranes. This work was highlighted by JACS Spotlights entitled “Direct Chiral-at-Cage Carborane Construction”. This work was carried out under the supervision of Profs. Zuowei Xie and Zaozao Qiu at Shanghai-Hong Kong Joint laboratory in Chemical synthesis, in collaboration with Prof. Yong Tang and Prof. Shu-Li You at State Key Laboratory of Organometallic Chemistry and Prof. Wenjun Tang at State Key Laboratory of Bio-Organic and Natural Products Chemistry, which sets a very good example for the active collaboration between Shanghai and Hong Kong researchers in SIOC. This work was financially supported by the National Natural Sciences Foundation of China, CAS-Croucher Funding Scheme and NSFC/RGC Joint Research Scheme.